Enterprise Architect has a sophisticated and flexible documentation engine that helps you to create and disseminate high quality and fully customizable documentation directly from the model, in document or web page format. A fundamental reason for constructing models is to communicate ideas and concepts, and to create a shared view of a system or process. While many users will be able to view the models inside Enterprise Architect, there are circumstances where screen viewable or printed documentation is required. Model driven document generation is a powerful productivity tool because when a model is changed the documentation can be automatically regenerated, saving time and resources and reducing the possibility of errors. The carefully crafted and versatile built-in templates help you to generate high quality documentation out-of-the-box. Project management and strategic information can also be generated to a series of charts and graphs that provide a visually compelling representation of important project data. The charts are configurable and can be included in documentation or displayed visually in diagrams, or incorporated into a management presentation. 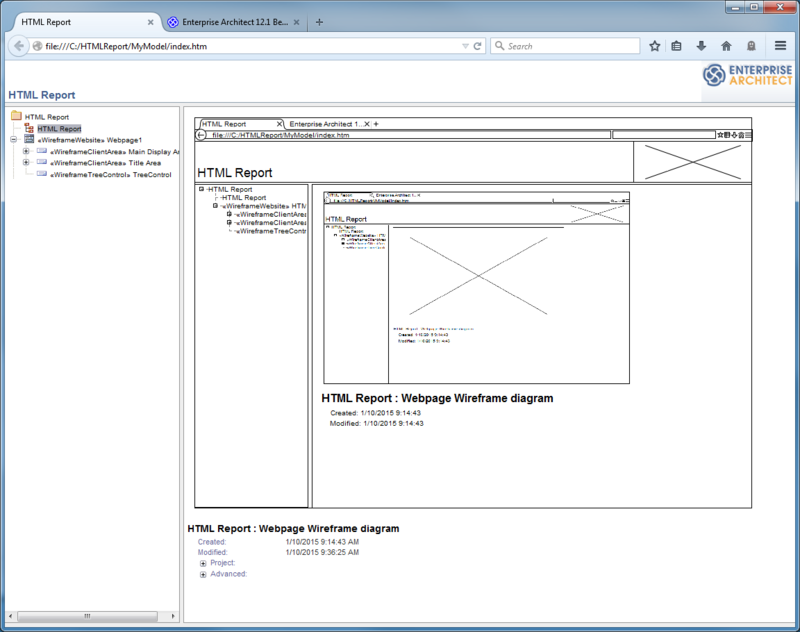 This collection of images demonstrates the output of Enterprise Architect's Web and Document reports, including a sample of editing a document template. 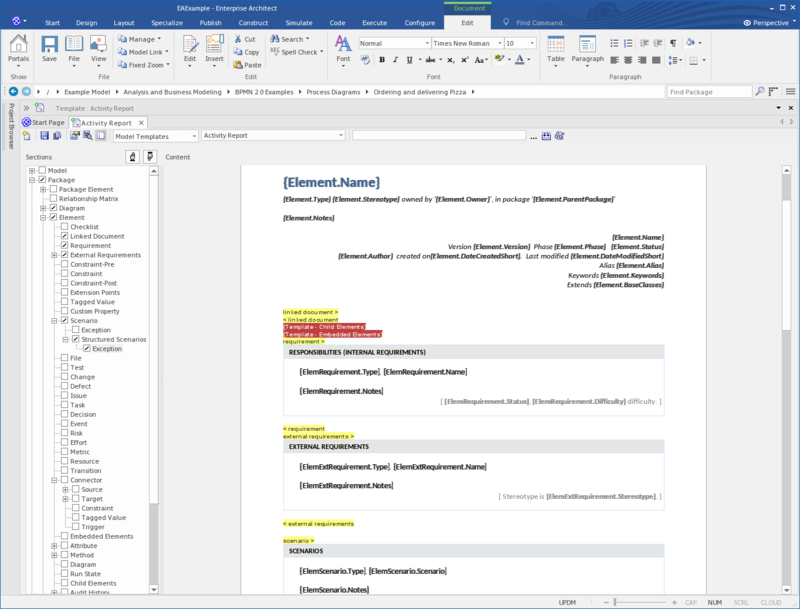 One-click generation of RTF, DOCX and PDF style documents. Deploy your project via the internet or intranet for quick and easy team communication. Publish your model as a Joomla! article in a local Joomla! installation. Bring your reports to life with up-to-the-second charts and graphs from your model. Customize your reports at a model level by defining your report structure and content via a diagram. Tailor your reports to give them your own unique corporate look and feel, ensuring all documentation looks the same. You can generate Document reports in a number of document formats, which you can tailor using templates and Stylesheets to alter the content and appearance of the generated output. Using Virtual Documents, you can draw out information on structurally separate model elements in a set of individual reports, or in a combined report under a master document with common headers, footers and styles. You can also generate a number of system-provided reports on different aspects of your model, such as the elements in a Package in Implementation relationships or in Dependency relationships. It is possible to provide automated web-based publishing of your Enterprise Architect models, making it simple to explore large models efficiently on-line. You can export an entire model or a single branch of the model to web pages, or to Joomla! Articles, and also create web style templates to customize the web page output. You can capture statistical information on a range of element properties across the model, and display this information on a diagram in one of several formats, such as a pie chart, bar chart or 3-D column chart. You can also print and distribute the charts you have created, using the standard 'Diagrams Only' report facility.